Today, I would like to refer to another painting which is very interesting to me. It is Picasso’s Mother and Child. I am not surprised at this analysis. After all Picasso had had so many women in his life. He removed himself from the painting. What does it symbolize? This painting was painted in 1921, in his Neo-Classicism period (1920-30). It shows heavily built sculpture-like women. The famous one in this period is at MOMA: “Three Women at the Spring” 1921. “Curator, Kirk Varnedoe: When you look at Picasso’s Three Women at the Spring this represents the embodiment of what one calls the return to order—the idea that after World War I, French society wanted to reestablish its roots with the grand tradition and a kind of solid, reassuring, sculptural vision of the human figure rooted in classicism. It was an art of reassurance, of rebounding after the experimentation of the teens. And yet when you look at this picture, it’s not really a conservative picture—the tubular nature of the arms, the large abstract rhythms of the figures are very much a legacy of his more radical work. The Mother symbolizes the Yellow River which is the cradle of the Chinese civilization. What is special about this Mother sculpture are her facial features. Does she look like most Chinese Han people? No, because the people in Lanzhou are the Hui minorities who have some western facial features . Let us find out where is Lanzhou and what is its significance in formulating the cultures of this part of the world. We now know that the sculpture reflects the Hui minority ethnic group. When I saw this Yellow River Mother sculpture, I immediately thought about the Picasso’s painting of Mother and Child. Do you think there are some similarities between the two? As artists’ inspire each other, it is possible that the sculptor who made this sculpture 65 years later may have been inspired by Picasso. The sculpture is the work of a famous female Gansu sculptor He E. Actually He and Picasso have very different styles. 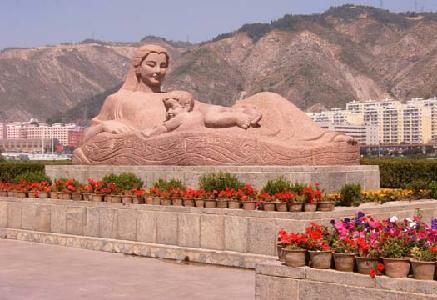 It just fascinated me when I saw the big Mother sculpture in Lanzhou because it was speaking to me. It spoke of the love of the mother for the child. I hope you do feel the same way. Which one do you like more? I like the Yellow River Mother more because of her smile and its beautiful face. 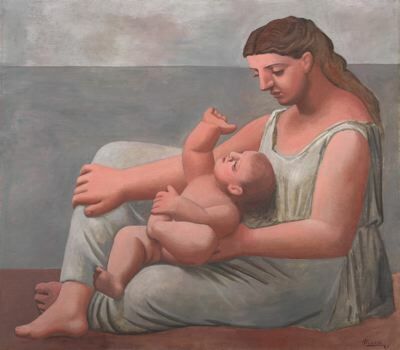 In Picasso’s painting, the mother seems to have some hidden sorrow on her facial expression and not as beautiful. Indeed none of the women drawn by Picasso is like a regular beauty. Both pieces do have a similar theme: the love of the mother for her child. What do you think? I’d love to her from you! Interesting, thanks for sharing this. I think both are remarkable pieces of art. Well, I personally like western sculptures a bit more, which provide me with more imaginations; I think the face of the mother is like Buddha. I think she is not like Buddha, as the religion the people in this region observe is Islam. Islamic art does not have figures or people images like the other art. Buddha images usually reflect the local people’s images. I can write another post in this. Recently I didn’t have any Buddha pix of my own. I will keep this in mind. Perhaps I am wrong about this mother image. Let me find out more. Thanks for raising a good question . Hi Sarah: I am sure we will all miss you and your blog. I was writing something more on the Yellow River and found your remarks. I wish you all the best in your music projects. Perhaps one day you will post your music performance on You-Tube. Let us know. thank you, not until summer will I finish these projects, but will check out WP posts whenever I have time…. bye-for-now.